The Irish-led VENTuRE scientific expedition aboard the national research vessel RV Celtic Explorer has discovered a previously uncharted field of hydrothermal vents along the Mid-Atlantic Ridge – the first to be explored north of the Azores. The mission, led by Dr. Andy Wheeler of University College, Cork (UCC), together with scientists from the National Oceanography Centre and the University of Southampton in the UK, NUI Galway and the Geological Survey of Ireland, returned to Cork from an investigation 3,000 metres below the surface of the sea using the Remotely Operated Vehicle (ROV) Holland 1. 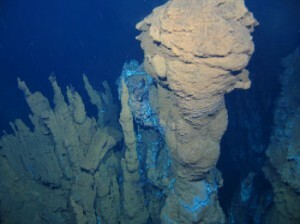 Hydrothermal vents, which spew mineral-rich seawater heated to boiling point by volcanic rock in the Earth’s crust below, are home to a rich variety of marine life that thrives in complete darkness on bacteria fed by chemicals. On the first dive, researchers found the edge of the vent field within two hours of arriving on the seafloor. The ROV descended a seemingly bottomless underwater cliff into the abyss. They never reached the bottom, but rising up from below were these chimneys of metal sulphides belching black plumes of mineral-rich superheated water. Often the search for vents takes much longer, and success is a testament to the hard work and skill of everyone on board. Patrick Collins from NUI Galway’s Ryan Institute, who led Ireland's marine biological team investigating this unique ecosystem, is working in collaboration with Jon Copley of the University of Southampton to catalogue and characterise the species found at the vents. Scientists have called the discovered vent field ‘Moytirra Vent Field. Moytirra is the name of a battlefield in Irish mythology, and appropriately means ‘Plain of the Pillars.’ The largest chimney found is more than ten metres tall – and it's named ‘Balor’ after a legendary giant. In comparison with other vent fields, Moytirra contains some monstrous chimneys and is in an unusual setting at the bottom of a cliff—a real beauty. 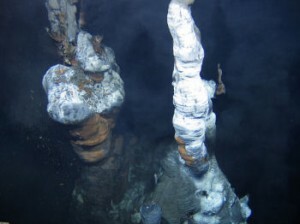 Hydrothermal vents occur where cracks in the Earth’s crust allow seawater to penetrate downwards into areas of subterranean volcanic activity. Here the seawater is not only heated to boiling point, but also permeated with dissolved minerals and suspended solids from the molten rock. This heated seawater then gushes back upwards into the ocean, giving rise to ‘black smokers’ and ‘white smokers’ – similar in appearance to miniature erupting volcanoes. The first indications of the Moytirra Vent Field being investigated by the mission were sensed in 2008 by scientists aboard the UK research vessel RRS James Cook through the pinpointing of a plume of heated water emanating from the seabed. The VENTuRE expedition deployed the Remotely Operated Vehicle ROV Holland 1, precisely locating the source of the heated water and getting the very first images of what it looked like.